Like iodised salt, staple foods like cooking oils fortified with essential micronutrients can help address nutrient deficiency in India. A study by the World Bank in 2006 showed that nearly 50% of India’s rural population was plagued by malnutrition. The seminal report, titled Undernourished Children: A Call for Reform and Action, estimated that there were nearly double the number of underweight children in India than in Sub-Saharan Africa. Since then, while some progress has been made, many reports have continued to highlight India’s malnutrition problem. As of 2016, almost 39% of India’s children under the age of five display stunted growth and 21% are wasted (i.e. show a poor weight to height ratio). The World Health Organization (WHO) however defines malnutrition broadly as ‘deficiencies, excesses or imbalances in a person’s intake of energy and/ or nutrition’. Thus, the pictures we most commonly associate with malnutrition mask the detrimental effects of micronutrient deficiency, which is far trickier to solve. Required by the body in much smaller amounts than macronutrients, micronutrients like vitamins and minerals also manifest pandemic deficiency rates. Vitamin D deficiency, especially, has reached near-epidemic levels, with an estimated prevalence of 70-90% of the population in the Indian subcontinent as per a study conducted in 2014. Additionally, the Food Safety and Standards Authority of India (FSSAI) estimates that 57% of the country’s children suffer from vitamin A deficiency. Annually, an estimated 330,000 child deaths in India are precipitated by vitamin A deficiency, as per a UNICEF report. These statistics are especially alarming as deficiency of essential micronutrients (vitamins, iron, zinc, iodine and folate) in childhood can cause a range of developmental delays. Vitamin A deficiency, particularly, can have serious consequences among children – blindness, reduced immunity, greater susceptibility to infectious diseases and growth impairment, to name just a few. Apart from giving birth to undernourished children, expectant mothers who are malnourished are also highly vulnerable to maternal mortality. Chronic micronutrient deficiencies can have far reaching consequences even into adulthood, impacting the affected individual’s educational opportunities, work output, life expectancy and healthcare costs. Micronutrient deficiency contributes to annual losses of over 1% of the Indian GDP i.e. almost $22.6 billion. In India, geographic, economic and socio-religious factors contribute to the prevalence of malnutrition among certain populations. Lasting sub-optimal intake of micronutrients becomes a critical problem as the human body itself cannot synthesise some nutrients such as vitamin A. It is, thus, dependent upon food sources rich in pre-formed vitamin A (carrots, pumpkins, fish etc. ), some of which may not be easily accessible or affordable for the economically weaker segments of the population. In the past few decades, the Government of India has rolled out vitamin A supplementation programs to target high-need populations. These are however expensive to achieve and maintain at a country-wide scale. A complementary solution to supplementation and dietary diversification strategies is staple-food fortification. This is defined by the WHO as ‘deliberately increasing the content of an essential micronutrient i.e. vitamins or minerals in a food, to improve the nutritional quality of the food supply and provide a public health benefit with minimum risk to health.’ Food fortification has proved to be one of the most effective ways to supplement the nutrition needs of a population. One of the biggest food fortification success stories in the world remains the national salt iodisation programme of India, rolled out in the ‘50s. Nationwide-mandating of salt iodisation led to a whopping 92% of Indian households adopting iodised salt. The success of this programme shows that a well-planned initiative to fortify common foods such as edible oils can effectively help tackle malnutrition in the country. Vitamin A is an oily vitamin, and hence goes very well with edible oil. Accordingly, edible oils have emerged as a prime contender for viable vitamin A fortification. In India, the consumption of edible oils ranges from 12 to 18 kg per annum per person, with total edible oil demand projected to rise up to 29.4 million tonnes by 2020. Oil fortification, i.e. the process of adding micronutrients to edible oil to increase its nutritional value, is expected to achieve almost 99% penetration of the Indian population due to the widespread use of cooking oil. All kinds of edible oils (soybean, palmolein, groundnut, cotton seed, mustard, etc.) can be fortified. At an individual level, fortified oil can help a person meet 25-30% of the recommended dietary intake for vitamins A and D, according to FSSAI. The appearance, taste, texture, flavour and shelf life of the edible oils remain unaffected by the process. With edible oils also being a key focus area of government food supply schemes, fortification can reach even the economically vulnerable segments and help them achieve essential nutrition levels. In Indonesia, vitamin A-fortified oil reaches almost 150 million consumers while in Philippines, controlled trial of fortified margarine reported improved vitamin A status in preschool-aged children over a six-month period. 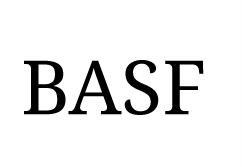 Scepticism regarding oil fortification ranges from stability of the nutrients (susceptibility to loss under conditions such as heating) to the cost involved in the fortification process. But many of these concerns stem from lack of awareness. The micronutrients used to fortify fats and oils are generally found to be stable, given the right quality of nutrients, refined oil and its packaging. In fact, stability tests in Indonesia showed that the heat stability of vitamin A is quite high – 60-80% of the vitamin is retained even after repeated usage (five times) of the fortified oil for frying. To safeguard against deterioration, the quality and purity of the added vitamin A are the key factors to look out for. BASF has developed a range of 40 vitamin A formulations for optimal performance in the respective foods, including vitamin A forms encapsulated in food starch for flour and sugar, and highly pure forms optimised for oil fortification. 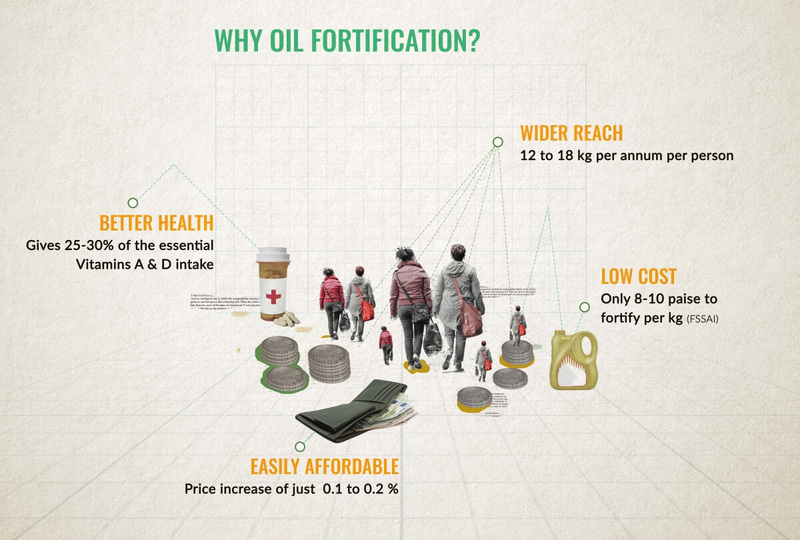 Oil fortification is also very affordable. According to the FSSAI, the cost of oil fortification is only 8-10 paise per kg. The equipment, technology and processes are well established to enable sustained production in India. There is no major price increase of the fortified product either, keeping it affordable for all. For example, adding a nutrient like vitamin A results in a marginal price increase of just 0.1-0.2%. The technology is simple and the process requires no special equipment as vitamin A is naturally oily and readily mixes with other oils and fats. The costs are ‘micro’ – but benefits of good nutrition over a lifetime are ‘macro’. With increasing awareness of the efficacy of food fortification, many countries have initiated large-scale trials and projects to facilitate widespread fortification of staple foods, including oil. International organizations such as UNICEF, WHO and Bill & Melinda Gates Foundation too have recognised food fortification the priority and potential of food fortification in helping meet nutrition goals across the world. Twenty-seven countries, moreover, have already mandated oil fortification, according to the Food Fortification Initiative. 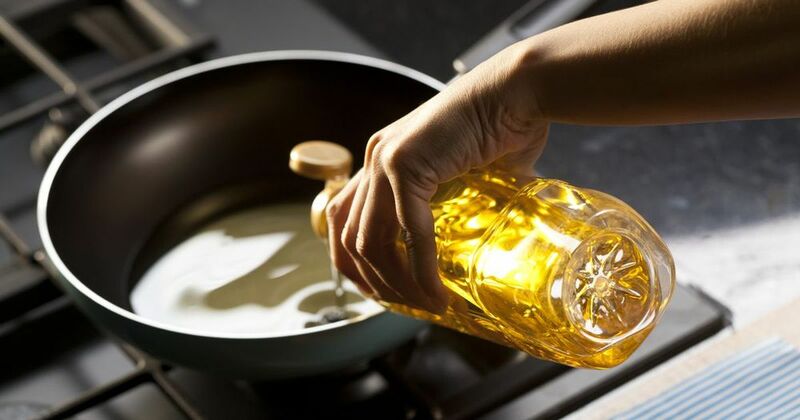 In India, FSSAI too has issued guidelines for all major manufacturers and processors to fortify their cooking oils with vitamins A and D within the next three months, while Rajasthan and Gujarat have already mandated the sale of fortified edible oil alone in the states. For the people of the country to benefit from food fortification, centrally mandated laws are required. There has to be a programme that is nationally scalable. BASF has partnered with global organisations working in the nutrition and healthcare sector, such as Global Alliance for Improved Nutrition (GAIN) and Strategic Alliance for the Fortification of Oil and other Staple Food (SAFO), and provides them with its technical expertise to help meet global healthcare objectives. The partnership of GAIN and the Confederation for Indian Industries (CII) has been instrumental in pushing for the mandate for oil fortification from the government of India. Including India, BASF’s Food Fortification Initiative addresses micronutrient deficiency in over 40 countries facing nutritional deficiencies of public health significance. As a part of SAFO, it has partnered with GAIN and GIZ, a German development agency to help industries and public-private alliances build technical capacity for cost-effective oil fortification while improving quality control. At the local level, it also provides local producers of staple foods with the technological support, advocacy support and test kits required to achieve high-quality food fortification at affordable cost. To know more about BASF’s food fortification initiatives, click here. This article was produced by the Scroll marketing team on behalf of BASF and not by the Scroll editorial team.